While helping rescue people from a fire Steel is trapped (see “got wrong”) and is forced to teleport, landing him somewhere in the sewers and fighting a monster. All this time Natasha is trying to call him to figure out why he’s suddenly so comfortable with her going off with Paul, sorry, “Boris” on a date. It turns out Steel ended up underneath the clinic and Natasha gets grounded for trying to joyride in his car. What they got right: The art is really good and shows off the abilities of computer coloring at the time. What they got wrong: You can decide how much is personal taste and how much is bad writing but I’m sure both are present. Steel is told to help his men because he gets treated like Superman, despite now wearing weaker armor. Steel’s genius solution is to ram a firetruck into the building to get the firefighters out. That’s why he ends up trapped, with the device that turns the cloth into solid armor damaged and forced to teleport, a power obviously ruined because someone (either Priest before this or a previous writer) decided they hated the power. Natasha is annoying as all heck, and the Rocky & Bullwinkle reference is getting old, saved only by Natasha forcing the nickname onto the boy like she’s Rudy from The Cosby Show in a more annoying personality. Not that Paul/Boris is all that interesting either, saying that John is treating her different because she has breasts now and trying “rosebud” as the password to the car security only for it to most obviously backfire. He’s boring and sometimes annoying, but not as bad as Natasha. Recommendation: There are some fair ideas here but not with these characters. I can’t honestly recommend this issue at all except as a bad idea. 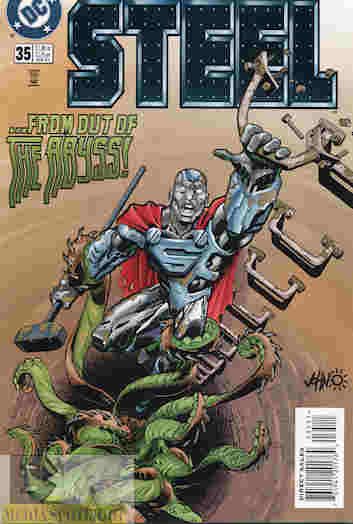 Posted by ShadowWing Tronix on April 23, 2018 in DC Spotlight, Yesterday's Comics and tagged DC Comics, DC Universe, Natasha Irons, Steel, Steel (John Henry Irons).